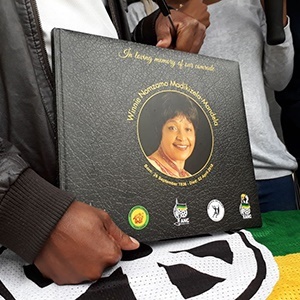 The Winnie Mandela condolence book. Police are investigating an incident that apparently took place outside struggle stalwart Winnie Madikizela-Mandela's home last night. There was a strong police presence outside the home on Saturday morning. Asked for details around the incident, police spokesperson Kay Makhubela told News24, "I must first brief national and they will get back to you." Later, Makhubela confirmed that there had been an incident outside the premises on Friday night, where shots had been fired, but said no-one had been injured. "We had forensic investigators on the scene to collect evidence, including spent cartridges, which will be sent for further analysis," he said. Makhubela said there had been no arrests, but a case had been opened and investigators were investigating the illegal discharge of a firearm in a residential area. Police Minister Bheki Cele was also reportedly seen at the house.